^ "Yahya b. Zakariyya", Encyclopedia of Islam. Anawati, G. C.. “`Īsā”. In P.J. Bearman, Th. Bianquis, C.E. Bosworth, E. van Donzel, W.P. Heinrichs. Encyclopaedia of Islam Online. Brill Academic Publishers. ISSN 1573-3912. Ayoub, Mahmoud (1992). The Qur'an and Its Interpreters. State University of New York Press US. ISBN 0791409937. Esposito, J. L. (2002). What Everyone Needs to Know About Islam. Oxford University Press US. ISBN 0-19-515713-3. Fasching, D. J.; deChant, D. (2001). Comparative Religious Ethics: A Narrative Approach. Blackwell Publishing. ISBN 0631201254. Khalidi, T. (2001). The Muslim Jesus: Sayings and Stories in Islamic Literature. Harvard University Press. ISBN 0674004779. Markham, I. S.; Ruparell, T. (2001). Encountering Religion: An Introduction to the Religions of the World. Blackwell Publishing. ISBN 0631206744. Rippin, A.. “Yahya b. Zakariya”. In P.J. Bearman, Th. Bianquis, C.E. Bosworth, E. van Donzel, W.P. Heinrichs. Encyclopaedia of Islam Online. Brill Academic Publishers. ISSN 1573-3912. Sonn, Tamarra (2004). A Brief History of Islam. Blackwell Publishing. ISBN 1405121742. Watt, W. M. (1991). Muslim-Christian Encounters: Perceptions and Misperceptions. Routledge. ISBN 0415054109. Wherry, E. M.; Sale, G. (2000). A Comprehensive Commentary on the Qurán: Comprising Sale's Translation and Preliminary Discourse (vol. II). Routledge. ISBN 0415231884. Tarif Khalidi (2003). 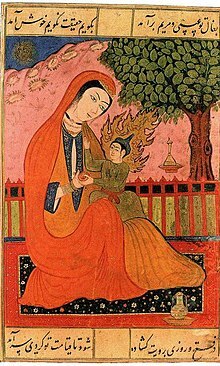 The Muslim Jesus: Sayings and Stories in Islamic Literature. Harvard University Press. ISBN 0674011155. Jesus: A Summary of the Points About Which Islam and Christianity Agree and Disagree Dr. Alan Godlas, University of Georgia. The Muslim Jesus (Google video) - This ITV documentary portrays Jesus as Muslims see him.